What is Blue Buffalo Wilderness Jerky Dog Treats? 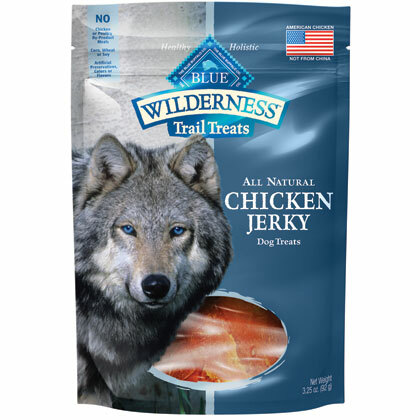 Blue Buffalo Wilderness Jerky Dog Treats are packed with protein (either chicken or turkey) and are loaded with flavor your dog will love. Blue Buffalo Wilderness Jerky Dog Treats are grain free and are made with wholesome, natural ingredients to promote health, strength, and vitality. If you want to reward your dog for good behavior or just want to supplement your pet's diet with a healthy snack, try Blue Buffalo Wilderness Jerky Dog Treats, made with your choice of chicken or turkey jerky. Your dog will love this healthy treat and will benefit from the all-natural ingredients and high protein content. Check with your veterinarian before giving Blue Buffalo Wilderness Jerky Dog Treats if your dog has special nutritional needs or allergies. Feed these Blue Buffalo Wilderness Jerky Dog Treats to your dog intermittently or as a supplement to your dog's daily food. Reward your dog for good behavior with these wholesome, protein-packed treats. You can vary your dog's diet by switching between the chicken and turkey flavors. Store your Blue Buffalo Wilderness Jerky Dog Treats in a cool, dry place. To maintain freshness, refrigerate this healthy dog food after opening. Ingredients: Chicken or turkey, depending on the flavor treat you choose, Dried cane molasses, Salt.